I never go out to dinner. I already know what I'm ordering before I leave the house. I love to try new foods and always order something different. The waiters always recognize me because I always go to the same restaurants. Out of my favorite coffee mug everyday. I'm still sleeping in the morning. What morning beverage? While catching up with some good company. The barista at Starbucks knows exactly how I like it. I always go visit the same places because I love them! I wish, I work way too much! Maybe next year. I can't keep track of all of the places I have visited. Too many friends to keep up with. I can't keep my days straight! I save my fun for the weekends. You can find me at work, home, or the grocery store. Typical, yeah right!? I'm all over the place! You like to enjoy life, but there is always room to change things up. You tend to know what you want, but good surprises are always welcome. A little shaking up could be beneficial. I'm Ready For A Challenge, Bring It On! You love adventure, you're ready to change things up at the drop of a hat, and life is pretty amazing! You are the prime example of shaking things up, but if you're not careful, you could overdo it. Sleep is important too! Keep Up Your Momentum And Bring On Some Challenges! It's time to shake things up! Life has gotten too predictable and while you know exactly what you're getting, there isn't much room for new experiences. It is time to try something new! I Am Definitely Up For Trying Something New! 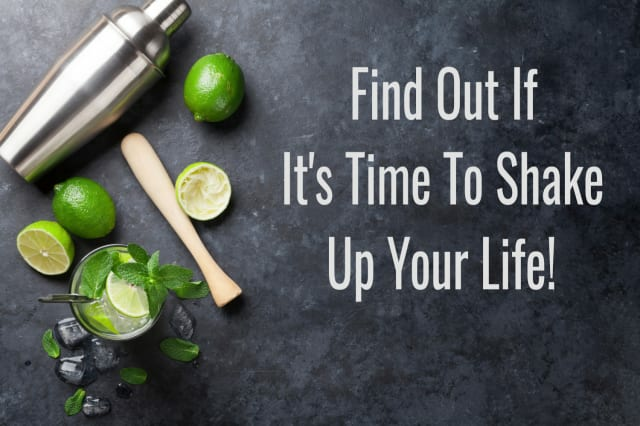 Are You Needing To Shake Your Life Up A Bit?